What is PROPHESIED for 1935! And greetings, friends. This is Herbert W. Armstrong with the good news of the World Tomorrow. Now, once again, here come some surprises. My friends, it's time to blow the dust off your Bibles and see what they say; and I ask you "See it with your own eyes." Will you get a Bible now? Will you open it and go through with us? And will you not be prejudiced, but believe what you see with your own eyes in your own Bible? I think it is the most astonishing thing of this time! Now we've been going through Matthew, Mark, Luke, and John — to see what Jesus Christ did preach, to see what doctrines He did believe and teach, and what customs He followed. It is said in the New Testament that He set us an example that we should follow His steps. Why don't we then? People today follow the steps of the ancient pagans, not the steps of Christ; and then they reason "Well, I don't see that it makes any difference." But God Almighty, in His Word (the Bible), says it does make every difference! This world is upside-down; this world is not happy; this world is in confusion; and this world is in chaos — and there is a reason. Maybe you can learn why your life has not been more full, and abundant, and more happy. Maybe you can learn why you've been carrying around fears and worries, and why you've had financial troubles and worries, and why you've had sickness and disease, and a lot of other things — if you will look at the Word of God and see what it says. It is NOT a superstition. It makes sense, when we see it as it is. Well, Jesus had come up to the Feast of Tabernacles. That's something that the Christians of today don't do. They observe Christmas, New Year's, and Easter. Now Jesus observed no Christmas, New Year's, or Easter, or Halloween, or St. Patrick's Day — and neither did the early Church, and neither is it established in the Bible. But those are pagan days! And today, the days that Jesus kept (the days the early Church did, and for 400 years the true Christians observed) are looked on with sort of a suspicion and a prejudice as if there is something very wrong about them. Why is it we think everything God gave is so wrong? Well, Jesus was at the Feast of Tabernacles. Now we've come up to John the seventh chapter and the thirty-seventh verse. Now first let me just explain that God ordained the Feast of Tabernacles to be observed forever; and you're all going to be observing it soon, my friends. Whether you like it or not, you WILL BE because Jesus Christ is coming soon to this earth; and He's coming as the King of kings, and the Lord of lords. He's coming to set up the KINGDOM of God on this earth — which will be a reigning, ruling Kingdom that will rule over every other nation and kingdom on the face of this earth. And every government of man, which is in force and effect now on the earth, is going to be torn down; and God will rule through Jesus Christ on His throne. Then ALL nations are going to be forced to come up to keep the Feast of Tabernacles and to worship the Eternal of hosts, who will be sitting on His throne — Jesus Christ. If they don't come, they'll have no rain. They'll have famine. Then, if they don't begin to observe the Feast of Tabernacles, God will send plagues until they do. Do you know why? It's because this is good for us; and the ways we've been following are not good for us. This world, as I say, had gotten itself into nothing but wretchedness, and unhappiness, and empty lives, and fears, and worries, with sickness and disease; and we are in a terrible state. We don't like the result; but we want to get the result we do desire our own way, and not God's way. My friends, there is a way of peace; and there is a way to happiness. God has given us that way. Now in the Feast of Tabernacles, which God established, let me just explain technically right here that it was a festival of seven days. Technically speaking, it was followed by another festival all together (which is the following day, or the eighth day). 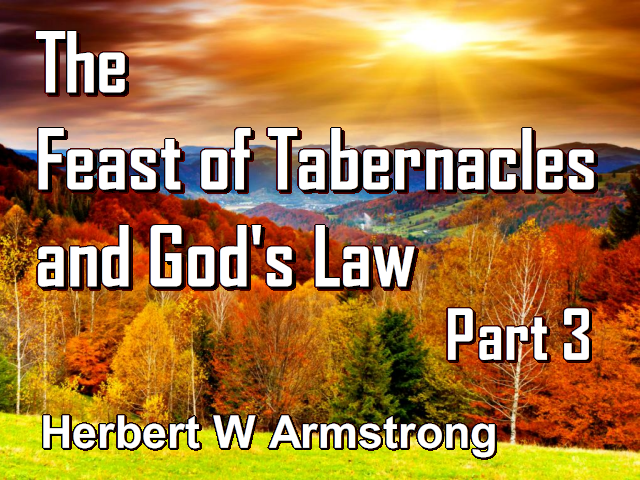 In a sense, it is separated from the Feast of Tabernacles; and yet, because they all come together, it had come to be considered as one great festival. This "last" was the eighth, or the "great," day of the festival; and that is the day that is here referred to when Jesus stood up and cried out and said what we are just going to see now. That day in itself, however, technically is a separate festival; and it pictures something. It was given to remind us of something. It was given to remind us of the FINAL EVENT IN THE PLAN OF GOD! My friends, why is this world like it is? It's because God is working out a purpose here below. Why were you born? You were born for a purpose. You were put on this earth for a reason, for a definite purpose! But most of you don't know that. Most of you don't know why you were put on this earth. Now God put us here for a purpose, and God is working out His purpose here below. He's doing it according to a definite plan. He has allotted so many years — a total of 7,000 years. And let me tell you something: that eighth day pictures the last part of the working out of the plan of God. The people (and the professing "Christian" church) have entirely lost the plan of God! They don't understand even the plan of salvation! They don't understand HOW God is working out His plan. Let me tell you something: the reason is because God gave these annual holy days that cumulate in the Feast of Tabernacles for the very purpose of PICTURING that plan and reminding His people of it year after year. Because they have not kept those holy days that God make holy (and that are never called any feast days of Moses anywhere in your Bible, but are the days of God) and because the churches have LOST them, they have lost what they picture and portray and were intended to remind the Church of year after year — the plan of God. They have lost it. The plan of God is very clearly portrayed in the Bible, if we would believe the Bible. But the Bible is profitable to correct us and reprove us, and people don't like it. And so, when they let it correct them and reprove them, my friends, they try to read their meaning into it. They try to their interpretation on it. The Bible should never be interpreted. No wonder people don't have it straight! No wonder they have twisted it, and turned it upside down, and maligned it, and polluted it; and now they believe just the opposite. Now let's get on with this. Now, isn't that strange language? I wonder if you can understand that? John 7:38 He that believeth on me, as the scripture hath said, out of his belly [that is, out of his innermost being] shall flow rivers of living water. Now the Holy Spirit had not been given to all men at that time. Let me tell you something, my friends: those two or three verses explain so much of the truth of God that is not known. It would take me several broadcasts to explain it to you. People read right over that. They don't get anything out of it. There is so much to be just drunk right out of those verses that it would take me several broadcasts to give it all to you. Now, in the first place, a great many people believe today that the Holy Spirit had already been given. They believe that Peter, and James, and John, and the apostles (or the disciples, as they were at that time) ... A disciple is a student or learner, and that's all they were at the time. An apostle is one cloaked with authority to represent his kingdom in a foreign land. The kingdom they represented was the Kingdom of God, and they represented it in this foreign land here on this earth. They later became apostles; but, at the time Jesus was speaking here, they were merely disciples. Now they had not received the Holy Spirit. It says so here very plainly. Yet a lot of people in the whole, great sectarian division of people of many denominations has been founded on a misunderstanding of this very thing — who believe that the Holy Spirit has always been here for people, and that they were converted. The amazing truth is, my friends, that there is no promise in the Bible of the Holy Spirit to any man prior to this time. What I means is that back in the days of Moses, for instance, and under the Old Testament to the nation Israel there was no spiritual promise of salvation. They were not given any promise of salvation. They were not given the Holy Spirit. Israel of old was a church. It's called a church in the seventh chapter of the book of Acts. There they are called "the church in the wilderness" and they were God's church, but they were not called "Church of God." They were called "the church of Israel" or "congregation of Israel" because they were a flesh-born church. They were not a spirit-begotten Church. They did not have the Holy Spirit. They had no promise of salvation. The only promises God gave them were material promises, and present promises, for this life — but not for the life to come, not for the World Tomorrow, not the spiritual promises of salvation and eternal life. John 16:7 It is expedient for you [He said to His disciples.] that I go away: for if I go not away, the [other] Comforter [the Holy Spirit] will not come unto you; but if I [go], I will send him unto you. Until that day, Peter was not a converted man. Jesus said to him once, "When thou art converted, Peter, strengthen the brethren." But he wasn't converted during this ministry and prior to the death of Christ on the cross. And Peter denied his Savior three tines, you know, during the very ordeal the night that He was taken to be crucified. And Peter loss his faith and began to sink when he tried to walk on the water. But AFTER he received the Holy Spirit, then Peter was a different man all together. Jesus said here "He that believeth on Me, as the scripture hath said, out of his belly shall flow RIVERS of living water." What did He mean? Well, "This spake He of the Spirit." In other words, then, He is speaking of the Holy Spirit. Now first He said "IF any man thirst, let him come unto Me and drink." There was a great big "if." Many, many, many years ago an uncle of mine use to say that that little two-letter word "if" (I-f) is the biggest word in the English language. And, you know, I believe perhaps it is. That's a very big word — if! Notice: there is a very big "if" standing between you salvation. That stands between you and eternal life, my friends. That little word right there, "if" — "IF any man thirst, let him come unto Me and drink." You know, there's the trouble: most of us don't thirst. We aren't hungry for the spiritual food. We are not thirsty for the spiritual waters that will satisfy. Now here God is using water and food, which sustain mortal human life, as the very picture or the type of that which does fill us with (and does help us to grow in) the spiritual life and beget us with the spiritual life. You know, my friends, even human reproduction is the exact picture of spiritual salvation; [and] very few people seem to know it. But, if you could understand the first chapter in your Bible — the first chapter of Genesis — you would see that it, even there, explains God's great purpose; and that purpose is that God is reproducing Himself. Salvation means that we are first begotten of God and later BORN OF GOD, born into the very Family of God! Jesus Christ becomes our elder Brother. He is the firstborn of many brethren. He was born of God by a resurrection from the dead; and so shall we be, IF — if (oh, yes, here's a great big "if") — IF we thirst, IF we hunger, IF we want it enough that we will give up everything for it. Now Jesus had given us some parables here: the merchant man, who went out seeking a pearl; and he saw one pearl that was just absolutely priceless. (You couldn't have set a price on it.) He wanted it so badly that he had to go and sell everything he had, and give up everything else, to have that one precious prize. It was worth it. He wanted it that badly. My friends, if you don't want salvation and eternal life badly enough that you're willing to give up EVERYTHING ELSE for it ... Now I don't say that God will require you to give up everything else. But I say that He will require you to be willing to give up everything else. And if you are not, and if you don't hunger and thirst for it that much, "if" (yes, that little word "if") stands between you and your salvation. You know a lot of people say, "Well now, that sounds reasonable. Yeah, I'd like salvation. Well, all right, I guess I'll go to church tonight; and I'll profess Jesus Christ publicly, and I'll get saved." And, you know, the way they look at it: they look at it like, well, this life is a journey — like going on a trip, on a railroad train, or something of the sort. The thing is though that, at the end of the journey, the track makes a sudden turn and shoots straight down to hell; and that's the way it was all set. They were born that way. But, if they just simply get the password, and if they go to church and profess Jesus with their mouth (That's all there is to it, they think. That's what they've been told — that automatically ... ), that turns the switch at the end of the line, and turns the switch so it will just suddenly shoots them up to heaven instead. Then it's all fixed. It's been done, and now we forget all about it. The preachers tell us there's no works to salvation and Christianity. "Just believe," that's what they tell you. "Believe on the Lord Jesus Christ, and thou shalt be saved." Well, you know, there is a dead faith and a live believing. And if you read the Bible a little further, one scripture interprets another; and one adds and completes another; and one of them alone might not be quite complete by itself. God doesn't always tell all of the truth in any one place. You have to read other scriptures. But He does give us all of the truth that we need, if you take all of the scriptures. And so, you'll read in James and other places (and even in Hebrews) that "faith without works is dead." In the very Faith Chapter of the Bible (the eleventh of Hebrews) you'll find it was by his faith that Abraham, the father of the faithful, proved his faith — until he was called "the father of the faithful." Now there is a dead faith; and the living faith is the kind that has good works in it. Now you have works. As I have mentioned before, they are either good or evil. And men don't love the truth, or the light, because their deeds (their works) are evil. You're going to have works, or deeds. Otherwise you just have to stop breathing, and you'll be dead. But, as long as you live, even your breathing is a kind of works, I suppose. So we have works. It's a case of what kind. Jesus said "If any man thirst, let him come into Me, and drink." Now, what are you going to drink? Why, the water is the Holy Spirit. "This spake He of the Spirit" — and it means the Spirit of God. Now let's get it. What is this Spirit of God? "He that believeth on Me," first "let him come to Me and drink." Then, "as the scripture hath said, out of his belly (You drink in of the Holy Spirit. "Out of his belly ... ") shall flow RIVERS of living water." And that "rivers OF LIVING WATER" is the Spirit of God, as verse 39 says:" This spake He of the Spirit," which they were to receive (and they did receive on the Day of Pentecost, later). John 7:38 As the scripture hath said, out [not "in" but "out"] of [out of] his belly[Out of the inside of him, out of his innermost being] shall FLOW [Oh, they're going to flow!] like RIVERS of living water. These waters are alive. They're living, and they are active, and they're in motion, and they're flowing. Now I wonder if you get the idea? It's like a riverbed, and here are the waters rushing down. You know, we used to go up to a place up in Oregon — in the Cascade Mountains in Oregon — a very lovely place up there (a hot springs resort) which we took over at the time that God has set for the Feast of Tabernacles every year. And, you know, we used to read this very verse up there. It's on the Mackenzie River. It's a mountain stream. As you know, these mountain streams sometimes rush down rather rapidly because they're going down hill rather fast — a lot faster than you'll see over in the Mississippi or the Ohio River. They are comparatively quiet rivers. But this was a rapid flowing river, and we noticed that river up there. The waters had to flow down the riverbed. They couldn't get outside of it. There is a riverbed, and they flow down that bed. Now, if you can just get the idea here: the Holy Spirit of God flows out of us; but it's like a river, and a river flows in a certain channel (or a certain bed). It's the river channel, and it must flow down that exact channel. Do you know what the channel is? That channel, my friends, is the thing that nearly every professing Christian tries to reject — the thing that people don't want because they don't want to be corrected. It is THE WILL of God and THE WAY of God, which is expressed by THE LAW of God. The law of God is the river channel. The Spirit of God is the love of God shed abroad in our hearts by the Holy Spirit. The Holy Spirit is the LOVE of God. It is love, and it comes from God. Now in Romans 13 verse 8, you will read that love is the fulfilling of the law. Love fulfills the law; and it takes love, and it takes a divine love to fulfill a divine law. Paul said here in the seventh chapter of Romans: "Wherefore the law is holy, and the commandment holy, and just, and good." And in verse 14 of Romans 7, he says: " We know that the law is spiritual." He is speaking of a spiritual law. We also know that there are material laws. There are fleshly laws. There are the physical laws that operate in your body, and you need to understand them better than you do. You'd have better health if you did. If you could understand the digestive system and what kind of food you ought to eat, and if you understand better which kinds of food you ought not to eat (which you probably are gullibly and innocently but ignorantly too just poking right down your stomachs). You think you enjoy the taste of a lot of things that are causing bad health, and sickness, and disease. Many of them gradually build up the sickness and the disease. It may take you 20, or 30, or 40 years before the disease comes; and you've been building it by eating these wrong foods all these years. You are breaking a physical law. Now that's important. But how much MORE IMPORTANT then, my friends, is the spiritual law? The great spiritual law that requires the spiritual love of God, which you can receive only from God to fulfill that law! Paul said he would not have known sin except the law had said "Thou shalt not covet." Now, the law that said that is the Ten Commandments; and the Ten Commandments are not a law of physical duties, but a law of spiritual principles. They involve some physical acts. That's true. But the principle is always spiritual and never physical. Paul said here that love is the fulfilling of the law, and that all who fulfill the law have love, and so on. So it requires the love of God. He that loveth another hath fulfilled the law. That's the thirteenth chapter of Romans and the eighth verse. (Romans 13:8.) Then Romans 13 verse 10, love is the fulfilling of the law. There are two of the Ten Commandments, and that's the law that he is speaking about; and love fulfills that law. "Thou shalt LOVE thy neighbor as thyself." That's the whole law, but it has points; and one of the points is 'do not kill', and another is 'do not commit adultery'. Now if thou commit no adultery (you don't break that point), yet if thou kill, thou art become a transgressor of the law. If you don't break either of those points, but break any other point of the law, you are a transgressor! Now love is the fulfilling of that law. Here's the thing: you have to thirst for righteousness, and "all Thy commandments are righteousness." (Psalms 119:172) There it is again. It's the way of God. It's THE WAY to peace. It's THE WAY to happiness. It's the spiritual principle that will make you happy. It's the spiritual principle that brings peace, and love, and happiness, and joy, and everything that we all want. Everything we crave! Listen: the trouble is we crave the results, but we don't hunger and thirst for THE WAY — THE WAY to that result; and the way is the righteousness of God, the law of God. Now then, if you hunger and thirst for it enough that you are willing to give up everything else for the way of God, of course you are going to have to go contrary to the ways of men; and you're going to be persecuted because "all who will live godly in Christ Jesus shall suffer persecution." And Jesus said, if you believe on Him (and that's a living belief that is proved by obedience, and not a dead faith), "as the scripture hath said, out of his belly shall flow rivers of living water." You come to Him and drink. You drink what? The Holy Spirit! And the Holy Spirit flows out from you. How? In fulfilling the law, keeping the commandments of God. It flows in that river channel, and no other! (The Spirit of God) A carnal love: a carnal love will flow in some other river channel; and carnal love, which is lust, has been flowing down the way of disobedience. And there, my friends, is the whole of the gospel — right there in those few words.